Knowledge to enhance technical capabilities within the subject area. Understanding of how to innovate, generate and manage the creation of new ideas. In-depth knowledge of a certain domain of knowledge, that is related to engineering. 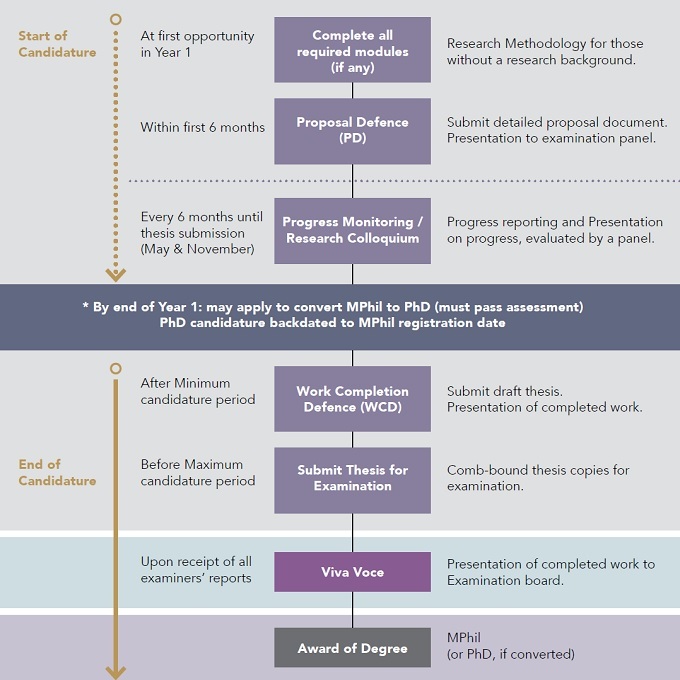 Advanced research experience and skills that enable students to pursue a PhD programme. Bachelor’s degree in related field not meeting CGPA 2.75 but above CGPA 2.50 in related field; can be accepted provided that candidates have at least 5 years of working experience in a relevant field. (a) Display excellent progress in their research. (b) Able to demonstrate the potential of their project to be expended to PhD level. (c) Pass a rigorous assessment. Successful conversion means that the student will no longer be an MPhil candidate but will instead become a PhD candidate with their candidature start date backdated to their original MPhil registration date. Hence, it allows the student to gain a PhD award within a shorter timeframe, without the need to complete a Masters programme. Ideally, student works with potential supervisors to develop proposal.